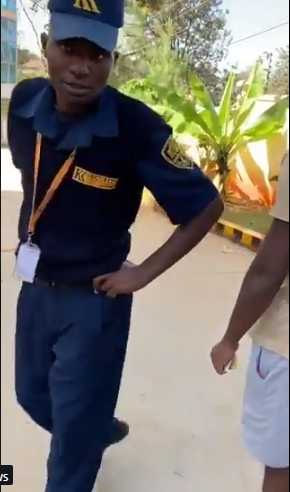 Tuesday, April 16, 2019- A video of KK Security Group Guard assaulting a woman in her own apartment in Kilimani, Nairobi has sparked outrage on social media. In the video, the woman is heard complaining after the guard refused to let her car in claiming that African Tenants had to get permission from Chinese Management (China Wuyi) before they could park. However, the guard was infuriated after he noticed the woman was recording him and when he asked her to stop recording and she continued, the guard slapped her so hard till the phone fell.. This comes amidst ongoing debate to have Private Security Guards allowed to carry guns. Watch the video below and reaction from Kenyans. The guard's job is to provide security not to violently react to words he thinks are insulting to him.